Did you know that in the wild, a happy elephant herd will have all its babies at more or less the same time, so the job of parenting and growing up can be shared? 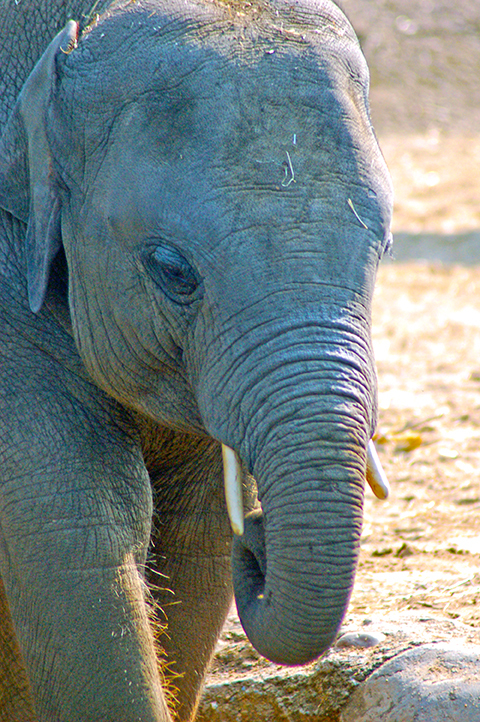 I didn’t know that until I learned it at the Dublin Zoo, which is believed to be the only zoo in the world that has ever had three elephant babies born within three months of each other. Lest you think that’s impressive, though, they’ve actually had seven baby elephants at Dublin Zoo in the past 4 years, and when you consider it takes most of two years to make a baby elephant, that’s genuinely extraordinary. And it’s only one of about a hundred things that I absolutely love about Dublin Zoo. 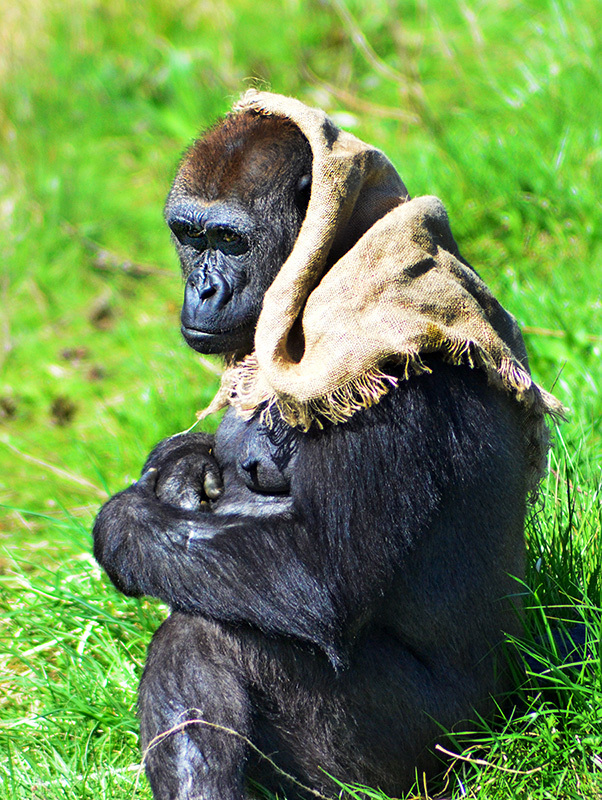 We started going to the zoo when we moved to Dublin and my own baby was about three months old. It’s my go-to spot when friends come to visit, I’m always like, “OMG ARE YOU ZOO PEOPLE BECAUSE THE ZOO HERE IS GREAT!” and then I drag them out and so far no one’s been disappointed. 🙂 We usually pack a lunch and make a day of it, because you can do either the front or the back half of the zoo in about 90 minutes, but the whole thing takes a solid three hours (more if you’re escorting kids who want to play at every. Single. One. Of the 8 designated play areas). 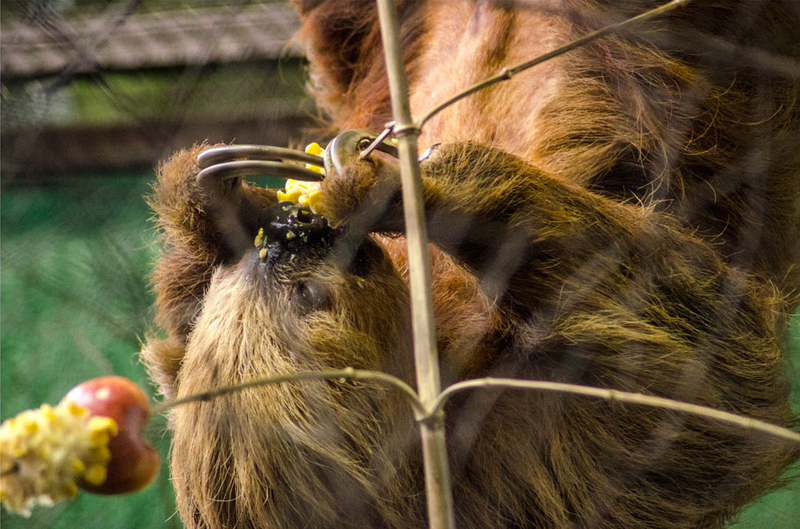 Two-toed sloth, eating upside-down. As you do. We generally go ‘backwards’ around the zoo, starting with the South American House instead of the big cats, mostly because if you go right from the gates instead of left, you are avoiding both the flow of the crowd and, more importantly to the parents out there, the Biggest Playground Of All, which can stop a zoo trip cold if approached early. OTOH, if you come around toward it near the end, you’re really glad for a chance to sit down while the kids play. Anyway, so here is a true thing: every time I go, I take basically the exact same picture of the sloth in the window because it’s so cute I can never resist it. I have like fifty of these pictures. We usually mash our faces against the windows to look for the Golden Tamarins, which are really staggeringly pretty monkeys, and the white-faced sakis and squirrel monkeys are usually bouncing around putting on a show of some kind for the visitors. Sometimes they’ll come mash their faces against the glass to check us out. Oh god. This post is only supposed to be around 1K words and I’m at 500 already, having only reached the first exhibit. Okay, HIGHLIGHTS, PEOPLE. HIGHLIGHTS ONLY. There’s the brand-new “Zoorassic World”, aka the reptile house, which is full of murder logs (Nile crocodiles, in this case), chameleons, snakes rescued from animal trafficking, and dinosaur fossils (or models of them, at least). There’s also the brand-new Discovery Centre, a hands-on learning facility, and we’ve talked about the 12-strong Asian elephant herd. We must now rush along to the back loop of the zoo (honestly, a short day at the zoo is 90 minutes and only does the front loop; you can genuinely stay there all day, which makes it worth the price of admission), where we usually head left first, ending up at the expansive African plains. 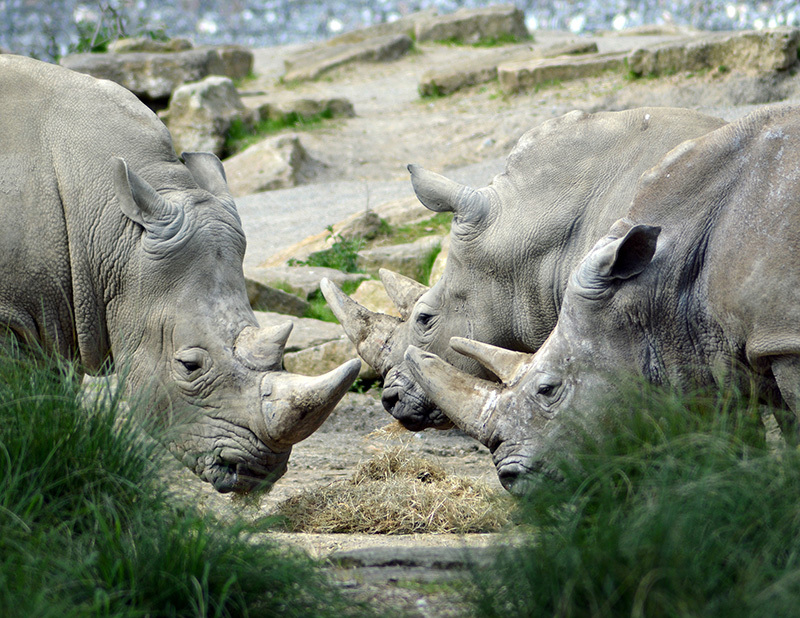 Southern white rhinoceroses. Rhinocerii. Whatever. Big slabs of walkable grey. We gotcher zebras (zeh-bra, by Irish parlance) here, and your Rothschild’s giraffes, who are apparently highly endangered but don’t seem to know it at the zoo, where they have babies regularly. (Baby giraffes are SIX FEET TALL. That’s just silly.) There are ostriches and the utterly gorgeous scimitar-horned oryxes, and a large stone wall keeping the rhinos away from everybody else. They, too, are both endangered and breeding well at Dublin Zoo: they’ve had several babies in the years I’ve been going, which—honestly, all the incredibly successful breeding programs at this zoo get me a little choked up. They’re working so hard to create healthy, happy environments for these animals, and they’re clearly doing a really good job, because unhappy animals don’t breed much or easily. But we must rush along to the gorillas! Now, the gorilla island was the first new habitat that opened after I started going to the zoo regularly, and for the first several months, Harry, the silverback (now sadly deceased), sat with his back to the window, putting his huge, solid self between the humans and his family in this unfamiliar space. Watching him, and them, become more confident in their new home was beautiful, and now everyone is absolutely comfortable there. Then, across the water are the chimpanzees, where one afternoon I watched the old man of the crew sit impatiently on the beach, waiting for the zookeepers to throw him oranges, which he loved. They threw lettuce. He tossed it aside. Carrots? Thrown away. After several obviously lousy (in his opinion, anyway) offerings, he lifted his hand and did that beckoning thing that humans do: fingers folding in toward himself repeatedly: c’mon, lads, give me the good stuff! 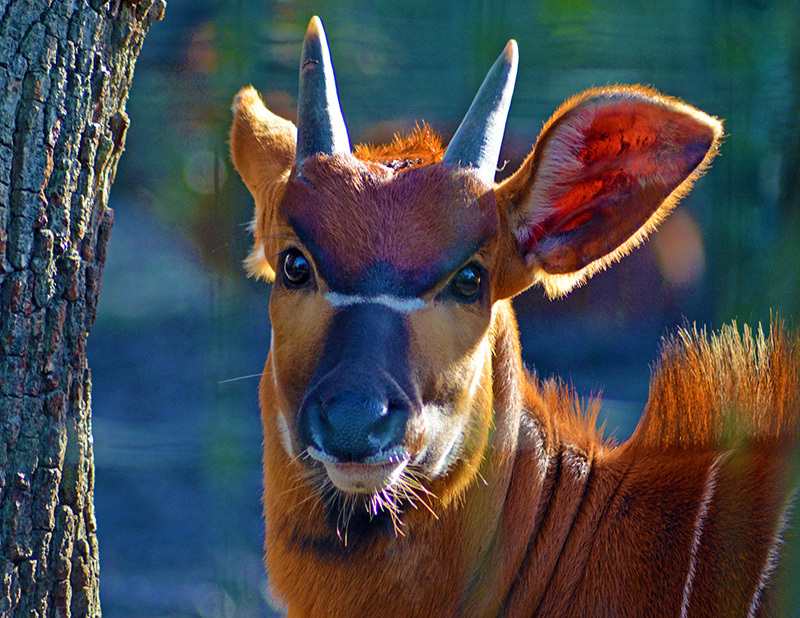 The very back stretch of the zoo has the African wild dogs (which my son called ‘tiger dogs’, for their coloring, when he was small, and I still think that’s a splendid name for them), a terrifically ugly bird, and the bongos, which are truly beautiful antelope. Their newest acquisition, though, are the “looks like a giraffe mixed with a zebra” okapi, which I have yet to get a good picture of but which are some of my favourite animals at the zoo. Oh god I’ve reached a thousand words. I MUST WRAP UP, AND YET THERE’S A WHOLE QUARTER OF THE ZOO TO EXPLORE STILL! 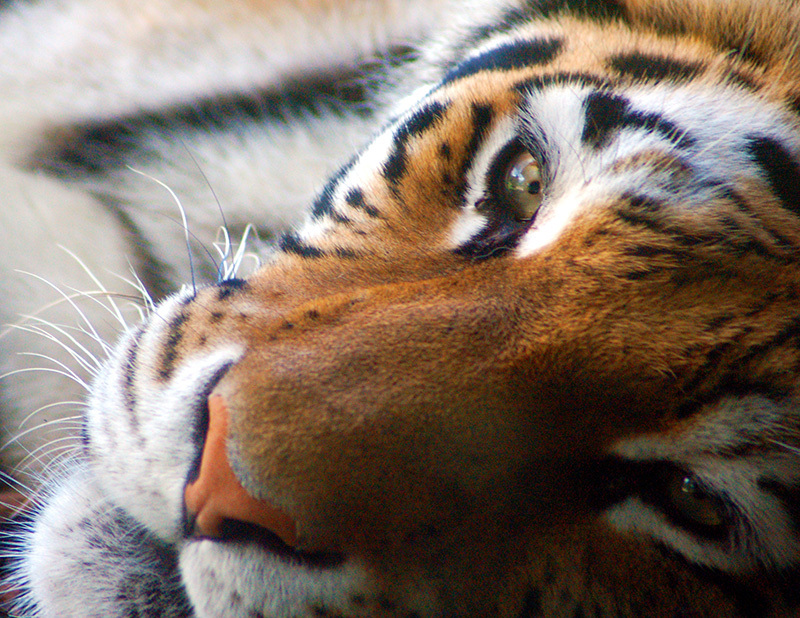 Tiger, clearly thinking “lunch!”: rises on his back legs, SLAMS AT THE GLASS, BAM BAM BAM! Snow leopards! Lemurs! BIG PLAY ZONE WHERE THE GORILLAS USED TO LIVE (how appropriate is that?). Lions! And wait, suddenly we’ve reached the end, with the lagoon and the gift shop! Honestly, the zoo is an amazing day out, and I heartily recommend it as a Thing To Do While In Dublin! C.E. 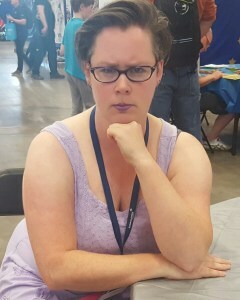 Murphy is the Alaskan-born, Ireland-dwelling author of some 30 books (The Walker Papers series, The Negotiator Trilogy, The Inheritor’s Cycle, & more), comics (Take a Chance), and short stories. Catie is a crowdsourcing funding pioneer, having run a number of highly successful Kickstarter, Indiegogo and Patreon campaigns in recent years.